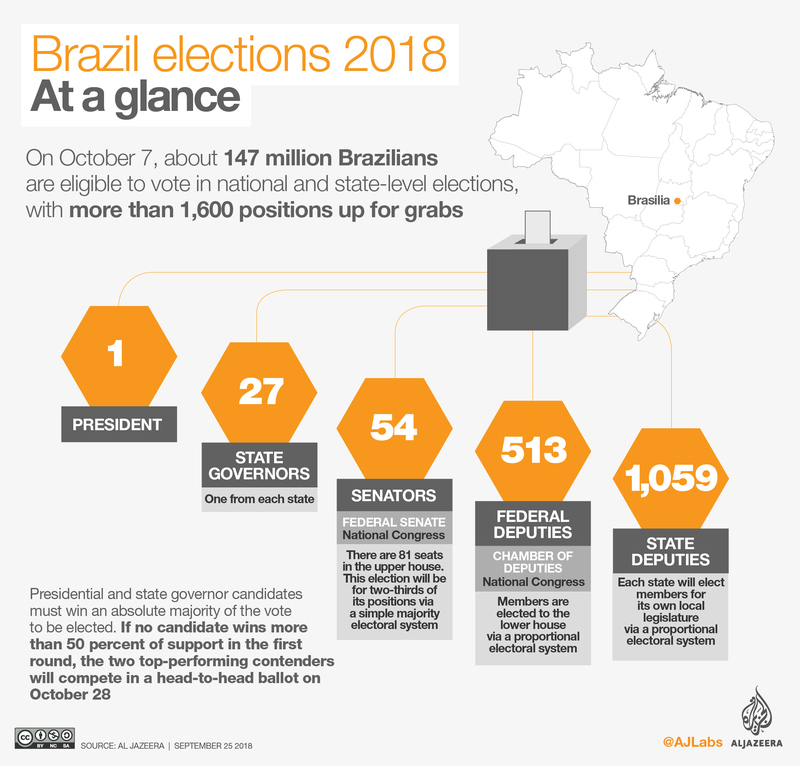 Rio de Janeiro, Brazil – About 147 million Brazilians will head to polls on Sunday in highly polarised presidential and congressional elections. Brazil, Latin America’s most populous country and largest economy, is a regional powerhouse. Home to about 210 million people, Brazil forms part of the five-member “BRICS” group of major emerging economies alongside Russia, India, China and South Africa. But several recent domestic setbacks have begun to erode the country’s standing on the world stage, according to Oliver Stuenkel, a professor of international relations at the Getulio Vargas Foundation (FGV). “Brazil at this point, and over the last few years, has lost its voice on international issues,” Stuenkel said. “It is no longer able to project itself as a model … its legitimacy is lower today than four years ago [at the last election],” he added. 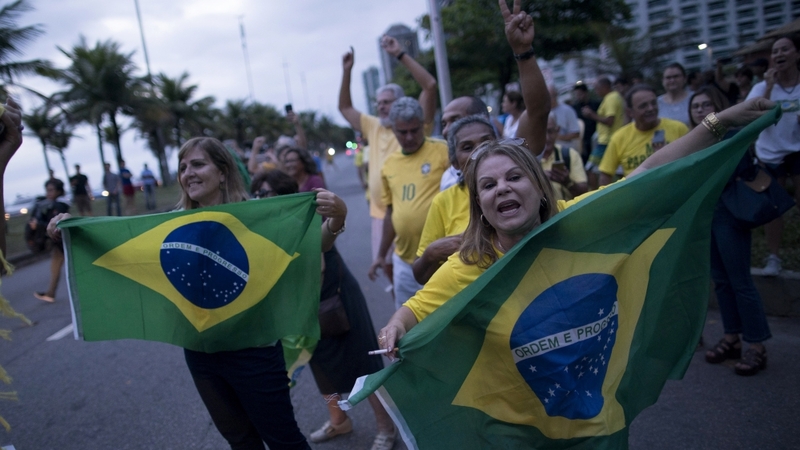 This year’s vote arrives at a critical juncture for Brazil’s future prospects as it battles to confront several complex and threatening challenges that have increased unrest and widened polarisation among the country’s citizens. At the top of voters minds are Brazil’s economic, political and social crises. From 2000-2012 Brazil seized on a global commodities boom to become one of the fastest growing major economies in the world. A more than two-year long deep recession, which began in mid-2014, has since rocked the country and stagnated growth. Widely popular former president Luiz Inacio ‘Lula’ da Silva was among more than 150 Brazilian business leaders, corporations and politicians convicted on the back of the investigations. He is now serving 12 years in jail and was barred from running in this election. Lula has consistently denied the charges, say they are politically motivated. The scandals involving the former president and others have decimated public faith in the country’s political class and democratic institutions. In the grip of a worsening public security crisis, Brazil is now home to seven of the world’s 20 most violent cities. The combination of these factors has placed Brazil “on the front lines of the global recession in democracies”, Brian Winter, vice president of policy at the Americas Society and Council of the Americas and editor-in-chief of Americas Quarterly, told Al Jazeera. “The issues present in Brazil are seen in a lot of places; disenchantment with the establishment, problems generating new employment, existential doubts over trade and rising violence,” Winter said. “But in many of those cases they are just worse in Brazil than they have been in a lot of other places,” he added. Voters will decide on the country 38th president and all 27 of Brazil’s state governorships. Also up for grabs are most of the seats in Congress – including two-thirds of the 81-member upper-house Senate and all 513 places in the lower-house Chamber of Deputies – and 1,059 positions within state legislatures. Far-right frontrunner and controversial firebrand Jair Bolsonaro of the Social Liberal Party has led opinion polls in the run-up to the vote, and is projected to win up to 32 percent of the vote, according to Datafolha polling institute. A Rio de Janeiro congressman since 1991, Bolsonaro has styled himself as a political outsider untarnished by corruption and pledged to end Brazil’s security problems by militarising the police and loosening gun laws. His numerous discriminatory comments on race, gender and sexual orientation and several highly controversial remarks about the country’s former military dictatorship – in power from 1964-85 – have angered and alarmed tens of millions of Brazilians. On Saturday, hundreds of thousands of Brazilians turned out in cities nationwide to protest his candidacy as part of a women-led #EleNao (#NotHim) movement. The next day, thousands of Bolsonaro’s supporters rallied throughout Brazil in response. Last month, Bolsonaro was stabbed while out canvassing support in the city of Juiz de Fora, in southeastern Minais Gerais state, and has been unable to return to the campaign trail since. Fernando Haddad, Bolsonaro’s closest opponent and the leftist Workers’ Party (PT) replacement candidate for Lula, is trailing the former army captain in second place with about 21 percent of support. Haddad, a former mayor of Sao Paulo and minister of education under Lula, has promised to “make Brazil happy again” and restore the economy to its former state of health under Lula’s presidency from 2003-2010. He is facing the difficult balancing act of translating Lula’s widespread popularity among Brazil’s working class into votes for himself while also appealing to parts of the electorate with whom the former president and the wider PT are deeply unpopular. Hostility towards the PT among some is high as a result of corruption scandals and the economic downturn which coincided with Dilma Rousseff’s, Lula’s successor, time in office from 2011 until her impeachment and removal from the presidency in August 2016. Neither Bolsonaro or Haddad appear likely to secure the absolute majority of support required to win office in the first round vote, on October 7, and are widely tipped to contest a second round head-to-head vote on October 28 instead. Polling suggests Ciro Gomes, Geraldo Alckmin and Marina Silva – a trio of centrists who have all run for the presidency at least once before – will not catch up with the two frontrunners. “In terms of the final two candidates it has actually been quite predictable,” Winter said. “Where it does become unpredictable is in this runoff, if it does confirm that we are looking at Bolsonaro versus Haddad then that’s about as close to a toss up as you get,” he added. Haddad and Bolsonaro both have high rejection rates, however, hovering above 40 percent. That could pose problems for Brazil post-election if, as appears likely to be the case, either of the pair are elected to the country’s highest office, according to Winter. 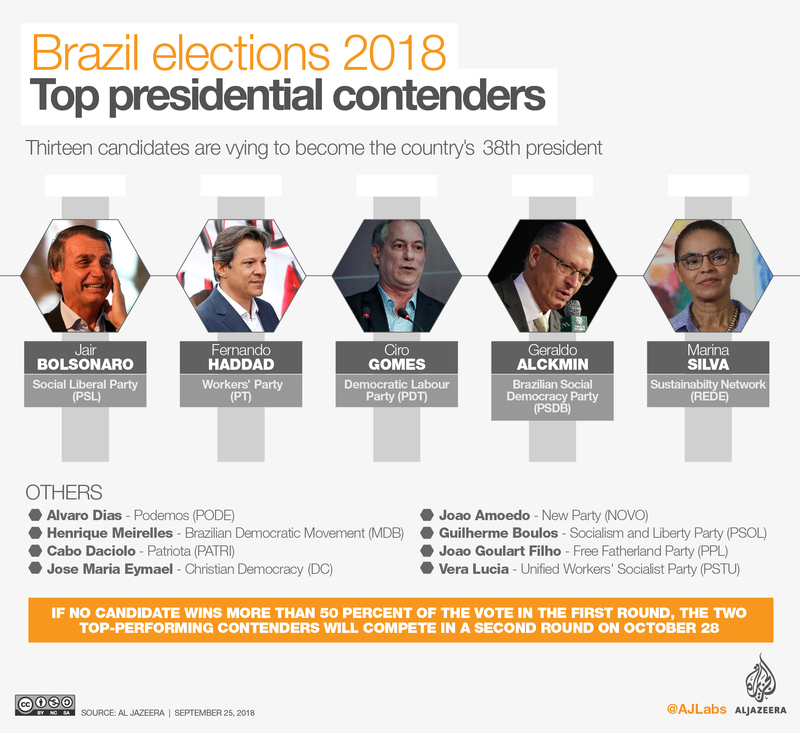 “If it’s one of these two candidates [Haddad or Bolsonaro] as president, I think they are going to face extremely difficult challenges on the economic and social front and possible questions about legitimacy,” Winter said. “I think Brazil could come out of the election with a very divided society that may not be focused on the right things, and maybe focused more on division and this war between competing cults of personality than the very real economic, social and security challenges,” he added. More than 147 million people are eligible to vote. Participation is compulsory for “literate” Brazilians aged 18-70. Although most results will be decided on October 7, there may be a series of second round runoff ballots held on October 28. If no such result is returned on October 7, the best two performers from the first round go head-to-head in a second poll two weeks later. “The broad sense of crises is clearly present, there is a notion that things are difficult … there is a sense of crises and that there is a complexity to the crises,” he said.